The Rose Serpentine Cremation Ring is expertly crafted from sterling silver into a tasteful design. The rose colored glass in this ring represents the month of October. This cremation ring will hold a nominal portion of cremains. 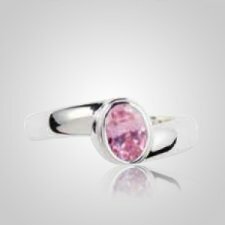 Create a memorable tribute or unforgettable gift with this stunning cremation ring. "We wanted something to hang around the mirror of our 36 Ford, so Mom could continue to go to the car shows with us. She really enjoyed the shows. I am very pleased. "